I love red wine. Unlike white and rosè, red wine is exciting, dramatic, mysterious and (best of all) you can have extended conversations about the red wine you're drinking. Also: delicious, right? Through my travels to wine regions around the world and fine-dining institutions, I've met hundreds of sommeliers and general wine freaks. From meeting wine experts on a consistent basis, you just get to know wines a little more than you'd expect. I've visited vineyards, crushed my own grapes, made my own varietal and even explored one-of-a-kind cellars that are shelved with centuries-old bottles. The esoteric world of red wine can feel intimating if you don't know it well, so I put together a "starter kit" that helps you understand red wine on an easy entry level (with some tips on how to "fake it" at dinner... with much practice, you'll eventually become a pro!). Red wine will always be in style, so take these pointers to get acquainted! Do you think I can fit all these barrels of red wine into my car?? 4 easy ways to show you totally know red wine! 1. Unlike white wine, red wine can age. Nobody says, "Give me your finest bottle of white wine from 1997." It just doesn't work that way. Red wines can age up to hundreds of years. It doesn't necessarily mean the older the bottle the better, but in most cases (depending on how the restaurant took care of the wine properly in a cellar), it is. I also find that older wines are more fun to talk about at dinner. 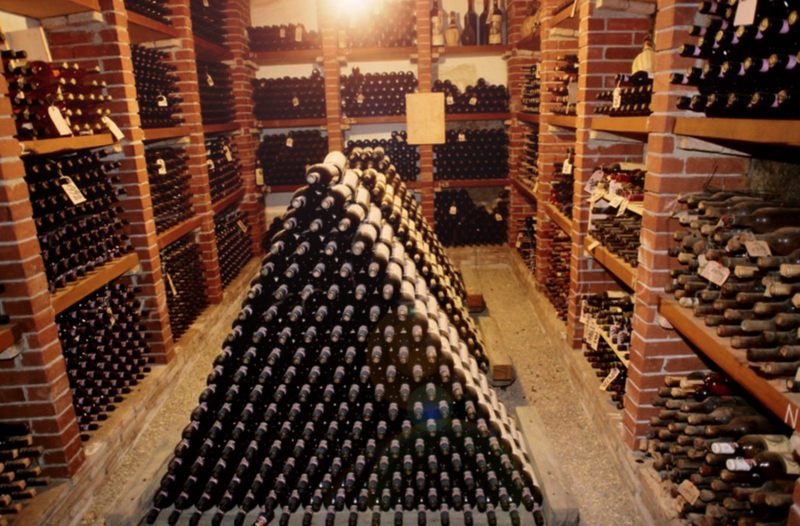 There have been cases of good wine produced due to the climate of certain years (i.e. : 2005 was a ***great*** year for Rioja wines, so they're going to be a little more expensive than, say, 2008), which the sommelier (if he's good) will know all about. HOW TO DO IT: Pick a random bottle of red wine from the menu and ask your sommelier/waiter: "Was this a good year for this (insert wine)?" It makes you look somewhat smart about wines but, more importantly, you start a fun conversation. Really old bottles of red wine get me excited. So much history! 2. The color of the wine will show age. If you tilt your glass of wine in light, you can get a "guesstimate" of what year it was produced. The more you can see through it (the lighter the color), the younger it is. If it's more dense/opaque, it's older. If you practice this a few times before looking at the year of the bottle, you can become a pro. HOW TO DO IT: Tilt your glass up, determine how dark/clear the wine is, then announce what year you think it was produced. This is always fun for the entire table before the sommelier shows you the year. Even if you're waaaay off at first, the fact you know this trick will impress your guests. 3. Look at the legs to determine alcohol level. When you tilt or swirl your wine glass, you'll notice the "legs" of the wine that stream down the side. This indicates the level of alcohol. The faster it comes down, the less alcohol is in the wine (say 10 percent). The longer it takes, meaning its thicker and slower, proves it has more alcohol content (say 14 to 15 percent). Doing this will impress your guests. HOW TO DO IT: Twirl your glass of wine and study the speed of the legs streaming down. Now tell your guests to do the same. See who got the closest guess by checking the alcohol content level on the bottle afterward. These are the "legs" of a wine dripping. 4. When in doubt, always, always, always order a Pinot Noir. Pinot Noir is the mother of great wines in any situation (casual lunch, important dinner, Netflix-and-chill, etc). It's complicated, not easy to produce (compared to other wines) and extremely delicious. It's lighter than Cabs, so it's great to drink without food, and the better wine regions include Willamette Valley, Sonoma and Burgundy (which all fall on the same latitude). Pinot Noir is basically luxury in a bottle. In general, they are almost always the most expensive varietal on a wine list, and they will never let you down. HOW TO DO IT: Even before the sommelier offers the wine menu, ask him/her: "Do you have any great Pinor Noir?" This shows you know what wine is best, and your guests will start worshipping you. Not really, but they'll be thanking you later for choosing such an exceptional bottle of wine.